WHY VOTE YES ON J? Students Want Convenient Housing Close to Campus.. and Downtown Davis! Residents here can easily walk or bike to campus and downtown Davis. This will free up some homes in neighborhoods around town that were originally planned for families. It will also help solve the parking problem downtown! Groundbreaking, Privately-Funded Affordable Housing Program! The owners are required to privately subsidize hundreds of beds every year for the life of the project! This will help the most financially-challenged UC Davis students achieve a higher education for generations to come. 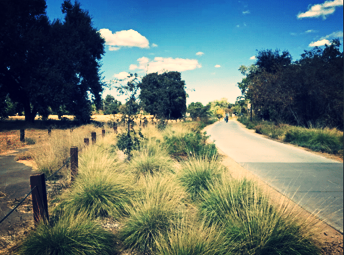 The Nishi property was chosen over 60 applicants for a grant by the California Strategic Growth Council for being the best site for sustainability. And, all energy used will come from renewable sources, and a 7-acre urban forest buffer will improve air quality in the vicinity and reduce the carbon footprint. Instead of Commuting, Residents can Live Here Car-Free! The site encourages walking and biking as the primary form of transportation through its location, limited car parking spots, and over 2,200 bicycle parking spots. This means fewer students commuting from Woodland, Dixon, Sacramento and elsewhere. Less driving = less traffic. Helps Fund our City and Davis Public Schools! According to the City of Davis Impartial Analysis and the City's Finance and Budget Commission this project is fiscally positive and will help fund our city and schools. *** NOTE: This project received unanimous votes from both the City Council and Planning Commission. For final approval, it's up to you! click here for MORE FACTS / LOCATION OF "NISHI"